There are multiple reasons for hosting a masquerade event, including Fund Raising, Business Function, Celebration, Wedding, to publicize a cause or simply to have some fun! What ever your reason for hosting an event, write it down clearly and share it with others that you may enlist to help you run the event. This way you will be much more likely to "just have fun" or achieve some other objective if you are clear about this right at the outset. How many attendees would be ideal? Are you going to have a theme for the party and if so, what? What music are you going to have (live or recorded)? Who are the ideal people to help you organize this event? Will you need to get any permits and approvals? How will you communicate with your ideal attendees to let them know about the event? Will you need any Health & Safety plans (eg fire evacuation etc)? How will you cater for the event? How will you fund the event? If you intend to charge for tickets, how much per person? Will you need to print tickets? What will you do for event lighting? Will you need to nominate a host or 'Master of Ceremonies'? What will be your seating plan? Are there certain groups that need to be together and others separate? Firstly, you need to send out invitations that create a great impression right from the start. Take the time to actually send a physical invitation out in the mail. Make your invitations special. A great idea is to use some beautiful Italian stationery from Florence. Each invitation can either be printed by hand using a calligraphy pen (nice!) or printed on a computer. Add a great final touch by adding a wax seal to the envelope! Send your invitations out at least 6 weeks prior to the event. Firstly, decide if you will make wearing a mask mandatory. This is highly recommended so that everyone will know what to expect. State on the invitations, no mask, no entry! 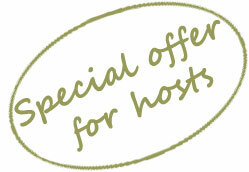 Make it 'By Invitation Only' to add a sense of exclusivity and privelige to attend. Venetian Carnival - go back to the source of the entire idea! Renaissance - awaken that artistic period again! Fairy Tale - set the theme topic only and let your attendees interpret. Lots of fun! Vampire - interpret this classic in it's many forms! Everyone is so busy today, ensure that your guests have access to an easily accessible source of masquerade masks such as here at www.italymask.com where they can browse through a fantastic range of Venetian masquerade masks and make a selection of a quality mask. If you are the event organizer, Italy Mask has a special deal that will allow you to buy your mask with a 75% discount and your guests to get a special promotional offer as well. Certain conditions apply. Decorations set the tone for your event. 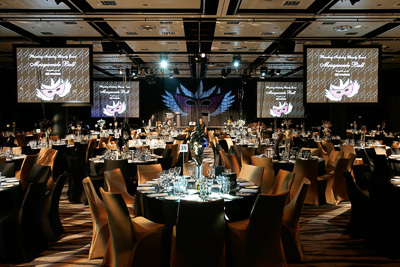 We strongly recommend putting quite a bit of thought into how you decorate your venue. See the example of large decorative Venetian masks in the picture at right create a great table center piece or hung around the walls. Use drapes of silk or velvet in a color to suit your theme liberally around the venue. Fill glass vases with feathers and beads. Sprinkle glitter and sequins around liberally. If you can include some active displays such as those show in the picture at the top of this page that also adds class and enables you to combine mood setting images perhaps of Venice with any other messages that you may want to communicate to your guests. Candles and candelabras set a great mood, but if you would rather, the use of twinkling lights or light strings also set a magical tone. If you can, also have some spot lights to highlight just the special affects you have included, such as some of the masks on display and the feather and bead vases or other special decorations. Having prizes for best outfit, most zany mask, best couple combination etc adds some great fun and incentive for your guests to really get in to the event. The picture attached is of a customer of ours who won 'Best Outfit' at a masquerade event in a Venetian mask and cloak. If you decide to do this of course, you will need to ensure you don't forget to plan for the process, timing and people you need to make this work and to judge the competition on the night. 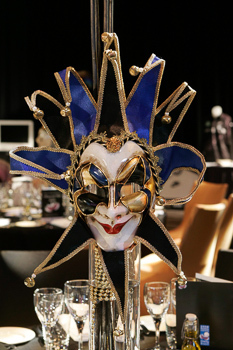 When planning for food for the masquerade, it is important to consider the theme of the event and what will go well with it, as well as whether you will be using a catering service or cook for the event yourself. Bear in mind that while a full face mask can make a stunning entrance, it will be obtrusive when eating or drinking, so it is beneficial to have a smaller mask for wear later during the event. We have included a few recipes for finger food, that can be ideal to serve, if the event is not centered around eating. Also considered the drinks you will be serving - the carnival theme goes well with colorful drinks whereas the more polished look of the 1920's theme works well with champagne or liqeurs.